Food and health: individual, cultural, or scientific matters? Food4Me is the acronym of the EU FP7 project: “Personalised nutrition: an integrated analysis of opportunities and challenges” (Contract No. KBBE.2010.2.3-02, Project No. 265494). The parties involved in the project are listed on the project’s Web site http://www.food4me.org/. Project coordination was carried out at University College Dublin, Ireland, Institute of Food and Health; Project Coordinator: Professor Michael J Gibney, Project Manager: Dr. Marianne Walsh. For overall correspondence regarding the Food4Me project: Professor Michael J Gibney, UCD Institute of Food and Health, University College Dublin, Dublin, Ireland, Tel: +353 (1) 716 2824, e-mail: mike.gibney@ucd.ie. 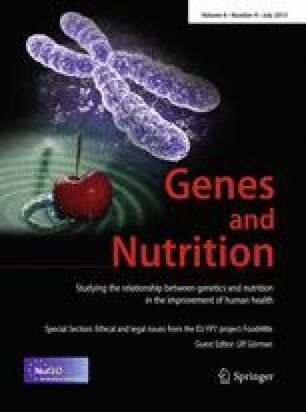 Nutritional genomics studies the interaction between nutrition and the genome, and it seeks “to provide the scientific basis for improved public health through dietary means” (Bergmann et al. 2008, p. 448). As an emerging application of nutritional genomics, personalized nutrition encompasses the vision to improve individual health control by offering access to an improved understanding of “the functional interaction between bioactive food components with the genome at the molecular, cellular, and systemic level in order to understand the role of nutrients in gene expression and…how diet can be used to prevent or treat disease” (Castle et al. 2007, p. 3). Consequently, in the context of personalized nutrition, food may be understood as a tool for good health. This implies an instrumental relationship between food and health, where food is ascribed a secondary value and health appears to be a descriptive biological concept. However, food plays a more significant role in human life; food is connected to social contexts, cultural values, and identities. Likewise, health is not necessarily a descriptive concept; it may be seen as instrumental in relation to individual life plans—a perspective that turns health into a more complex, value-laden concept. This article gives an introduction to cultural understandings of food and health. The wider definition of food and health is explored in relation to the commonly used scientific approach that tends to take a more reductionist approach to food and health. The different discourses on food and health are being discussed in relation to ethical aspects of personalized nutrition, leading to the following questions: What kind of ethical challenges may be identified for personalized nutrition in relation to concepts of food and health, which include cultural and value-laden aspects? And how are social and cultural concepts of food and holistic concepts of health related to the aim of individualization in personalized nutrition? The emergence and development of the life sciences has brought about changes in our understanding of nature and thus also of food. The significant contribution of the life sciences to increased living standards and a safer appraisal of food in the Western world have been accompanied, though, by an intellectualization of our relationship to food (Coff 2006, p. 61). Knowledge gained through the life sciences influences individual and cultural approaches to food and contributes to an increased intellectual and rational attitude toward food. For instance, information on labels of processed food packages has during the past decennia become more detailed and more explicitly related to health effects. The consumer is in the grocery shop confronted with information on different labels, some indicating health effects. Food consumption and the choice of food products are thus affected not just by personal taste, availability, and cultural traditions, but also by life science knowledge available on labels. Technological developments within food production, such as the development of novel foods, may be contrasted to cultural, social, ethical, and sensual relationships to food. The rational attitude is practiced in many ways, among others through scientific mapping and analysis of chemical substances in food targeted at understanding and improving human health. Though there has long been interest in the interaction between food and health, it is known today that this interaction is characterized by complexity. At the same time, there is an increased focus on health issues in different societies (Görman 2006). Thus, people’s relationship to food tends to be characterized by a tension between the reasoning and calculation that can be used to improve human performance and health and the sensual, physical, and cultural aspects of food that are vital for the experience of closeness, coherence, and comprehensibility. This tension can be expressed through the terms “nutrients” and “food.” The former relates to a scientific approach, the latter to a more comprehensive, culturally constructed approach. Ethnological perspectives on the role of food in human life illuminate different aspects of food, such as culture, relations, identity, and power. Falk (1994) pointed out that the eating community and the meal are the basic foundation of all societies. Hence, there is no culture without food. Food functions as a way to give structure to daily life and to ritualistically mark the passages from one formal life stage (e.g., eating cake at a wedding) or informal life stage (e.g., drinking a nightcap before bedtime) to another. The structuralist tradition (e.g., Levi-Strauss 1970; Douglas 1972) has successfully shown how food is used to classify different phenomena, thereby creating a common worldview among people who share a culinary culture. The most basic rule in a food culture is to classify which food is edible. Humans are omnivores but use only a part of the potentially edible substances in nature (Fischler 1988). Not only biological or geographical conditions determine the food eaten within a certain community, but also cultural norms. Ideas of what is edible may change between nations or between different classes in a society. Westerners’ rejection of eating raw fish until recent years is one example. Another is Scandinavian farmers’ traditional rejection of mushrooms as food, even though they were formerly served at banquets for the nobility. Food is a medium that creates bonds between people (Belasco and Scranton 2002, p. 2; Counihan 1999, p. 96). The word “companionship” signifies the sharing of bread (pan), and it points out the importance of food in human relations (Falk 1994, p. 15). The original human community, the kin, was based on mutual obligations to ensure the feeding of all members of the kin. We still make communities based on eating; food differentiates “us” from “them.” The intention to start some kind of relationship is often marked by an invitation to share a meal. Inviting a neighbor over for a cup of coffee or asking a potential partner out for dinner are a couple of examples of the role of food as a social lubricant. To reject an invitation to share a meal is a hostile act; it is a way of rejecting a social relation (Mauss 1950). The moment of eating is one of the rare moments when our body is open. By eating, we incorporate the surrounding world (Falk 1994). Since food is potentially poisonous, we are vulnerable when we eat, and the limit between the individual body and the self and the surrounding world is blurred (Lupton 1996; Counihan 1999). Eating food that has been prepared by somebody else presupposes, therefore, a relationship of trust. This highlights a relational aspect of food. Food is also used in more deliberate acts of constructing a personal identity. With food, we can tell who we are, where we came from, and who we want to become. At various levels, food is power. One who does not have enough to eat is powerless, while one who may control another person’s food intake holds certain power over them (Lappé and Collins 1986). Food is also evident in the struggle between certain classes in society (Goody 1982), ethnic groups (Bell and Valentine 1997), and nations (Belasco and Scranton 2002; Gabaccia 1998). Food also plays an important role with respect to an individual’s place in society. As Counihan observed, “One’s place in the social system is revealed by what, how much, and with whom one eats” (Counihan 1999, p. 8). Bourdieu (1984) has shown how distinctions based on taste work as a way to establish “cultural capital,” which in turn is important with regard to one’s role in society. In addition, food is an important part of gender relations (Adams 1990; Counihan 1999). The traditional female role of feeding the family (DeVault 1991) has been important in the exclusion of women from public power. But there is also a dimension of power in the act of cooking in determining what other members of the family should eat (Avakian 1997). The person that controls food intake not only affects bodily functions but may also imprint values and virtues, not least on children (Bell and Valentine 1997, p. 63f). Differences between public (barbecue = male) and private (casserole = female) cooking are notable in Western countries from a gender dimension, but the media’s creation of celebrity chefs has now started to change the gender dimensions of cooking and blur the distinction between the public and the private. Food cannot be reduced either to biology or culture since it is vital at the very same time to both the individual human organism and the building and maintenance of social relations: “Any given human individual is constructed, biologically, psychologically and socially by the food he/she chooses to incorporate” (Fischler 1988). Since biological and cultural dimensions of food and eating are inseparable, a multidisciplinary approach to personal nutrition is called for. In that regard, the ethical dimensions cannot be restricted to issues of private integrity or nutrition. The role of food in structuring everyday life—its role in social relations, personal identity, and power relations—should be considered when making ethical guidelines for personalized nutrition. Individually tailored nutritional advice should, for example, not be restricted to information about recommended amounts of nutrients or nutrients that should be avoided. Personalized nutrition advice could for instance include suggestions for meals and recipes. This is particularly evident when the concept of personalized nutrition becomes commercialized into products, concepts, and services. More individualized eating may make it more difficult for people to eat meals together. However, some products may make it easier for individuals that have been forced out of the eating community owing to problems with, for example, high blood pressure and diabetes, to be able to eat more or less the same meals as others in the household. Another possible effect of personalized nutrition is that meals are less standardized for all members of the household. It is easier to express an individual identity with food, which is a possible road to empowerment for individuals. Thus, questions as to whether concepts of personalized nutrition will strengthen or weaken social relations and affect power relations should be addressed when discussing ethical guidelines. Both the scientific or biological and cultural approaches to food are justified, but with different arguments. As a promising scientific approach, the success of personalized nutrition in future is likely to depend on the ability to integrate the scientific approach with everyday cultural, emotional, ethical, and sensual understandings of food. The tension between scientific and cultural and value-laden perspectives on food is found in a similar way within the philosophy of health. Contemporary philosophy of health has been quite focused on the problem of determining the nature of the concepts of health, illness, and disease from a biological and medical point of view. Some theorists claim that these concepts are value-free and descriptive. Moreover, according to this line of thought, a disease in a human can be detected through ordinary inspection and the use of scientifically validated procedures without invoking any normative evaluations of the person’s body or mind. To say that a person has a certain disease or that he or she is unhealthy is thus, given this interpretation, to objectively describe that person. Other philosophers claim that the concept of health, together with other medical concepts, is essentially value-laden. To establish that a person is healthy does not entail just some objective inspection and measurement; it also presupposes an evaluation of the general state of the person. Thus, moral values and social norms are integrated into the understanding of health. Christopher Boorse developed the biostatistical theory of health and disease (Boorse 1977a), which he revised in his famous paper from 1997b—“A Rebuttal on Health.” According to the biostatistical theory of health, health is defined in terms of statistically normal biological function. Two central definitions form the basis of Boorse’s characterization of health. First, there is the definition of disease: “A disease is a type of internal state which either is or causes an impairment of normal functional ability, i.e. a reduction of one or more functional abilities below typical efficiency.” Second, there is the definition of health based on this characterization that states laconically: health is identical with the absence of disease. It is significant that holistic theories do not refer specifically to survival but mainly to the quality of life or welfare of the individual. According to these theories, a person can be ill not only if the probability of the person’s survival has been lowered but also if he or she does not feel well or has become disabled in relation to some goal other than survival. Most medical treatments focus on the negative aspects of health—either disease or illness. This focus is understandable, given the attention that medical practice directs to disease. However, it is theoretically unsatisfactory to start a conceptual investigation with negative concepts without having characterized this positive state in itself. The reverse procedure is more promising. Two kinds of phenomena have a central place in holistic accounts of health and illness: first, a kind of feeling of ease or well-being in the case of health and of pain or suffering in the case of illness; second, the phenomenon of ability, an indication of health, disability or of illness. These two kinds of phenomena are interconnected in many ways. First, there is an empirical, causal connection. A feeling of ease or well-being contributes causally to the ability of its bearer. And a feeling of pain or suffering may directly cause some degree of disability. Conversely, a subject’s perception of his or her ability or disability greatly influences that subject’s emotional state. According to this idea, being in great pain partly means that the subject is somewhat disabled. Some degree of disability is a necessary criterion for the presence of pain, so that if a person’s ability is not affected, that person can be said not to be in great pain. Having at least in a preliminary way established ability as the most essential concept in health, we are confronted with a basic question: What should a healthy person be able to do? On an abstract level, those goals that are constitutive for a healthy person’s ability, designated “vital goals” (Nordenfelt 1995, 2000, 2004), have to be specified. The general idea is the following. To qualify as healthy, a person must have the ability, given standard or reasonable circumstances, to reach his or her set of vital goals. Two suggestions for the characterization of vital goals seem plausible. The first suggestion entails that a person’s vital goals should be equated with that person’s needs. The second involves the idea that a person’s vital goals should be equated with his or her wants. The idea of needs is not helpful since it is either empty, meaning simply “being a necessary condition for a goal to be further specified” (Liss 1993). Or, as in the traditional discussions of basic human needs (see, for instance, Maslow 1970), it already presupposes the concept of health: a basic need is one whose fulfillment is necessary either for survival or for maintaining health. The second idea of using a person’s own wants as the criterion of vital goals fails for a variety of reasons. Highly destructive wants exist, and there are people with an extremely low profile of wants. If highly destructive goals are adopted in the definition, the result is a counterintuitive proposal. Concerning the person with a low profile of wants, if only these very minimal wants are fulfilled, that person might die of starvation. It seems strange to found a theory of health on a person’s ability to commit suicide, for instance. The solution proposed here to the characterization problem rests on the notion of happiness (Nordenfelt 2000). A person’s vital goals are the states of affairs that are necessary and jointly sufficient for his or her minimal long-term happiness. This idea could be rephrased informally thus: a vital goal is a state of affairs that is either a component of or otherwise necessary for the person to live a minimally happy life. This includes more than mere survival. It includes life without disabling pain; it includes the realization of the most important projects of the person. Health is not identical with minimal happiness, nor with the set of vital goals that are necessary and together sufficient for minimal happiness. A person’s health is constituted by his or her ability to realize vital goals. Or, to choose as a final formulation, health is the bodily and mental state of a person such that he or she has the ability to realize his or her vital goals, given standard or otherwise accepted circumstances (Nordenfelt 2000, 2001). A distinctive feature of such a concept of health is that it refers to the subject him or herself. The healthy person is the person who can realize his or her vital goals, not vital goals in general. This may sound like a problem for the universal science of medicine. Should we acknowledge individual variations? Do as many health concepts exist as there are people? No. In fact, one definition is suggested in one brief formulation. However, it pinpoints the relational nature of the health concept. Health for people is a relation in which they stand with regard to their abilities, goals, and circumstances. As a consequence, we cannot just identify health with abilities tout court. We must also look into the vital goals of the subjects and reasonable circumstances in the environment in which they find themselves. Such a notion of health is promising with regard to personalized nutrition since it relates health to individual preferences. Different features of an individualistic, holistic theory of health are of relevance. By its very idea, personalized nutrition addresses health as the primary concept. Also, the primacy of ability and disability is essential since the potential of personalized nutrition depends on the individual’s motivation. A concept of health as the ability to reach the subject’s vital goals seems therefore highly pertinent. But this presupposes a self-conscious patient or consumer who is able to articulate his or her vital goals and preferences with regard to health. Researchers and providers of personal nutrition should therefore devise a strategy to inform and discuss with patients or consumers the implications of their vital goals and health preferences. Furthermore, an individualistic notion of health is a reminder of the possibility that people with high levels of vital goals benefit more easily. To reach beyond these groups remains a challenge. This is by itself not a problem for personalized nutrition as a potentially valuable tool for better health among certain groups of people. However, because of this potential injustice, personalized nutrition should be endorsed realistically with respect to its potential as a method not to replace but complement more global preventive programs. The latter should remain an essential but not necessarily completely obligatory objective of society. The above examination of discourses about food and health took as its point of departure the circumstance that food within personalized nutrition is a tool for good health and that this implies an instrumental relationship between food and health. By highlighting cultural dimensions of food and arguing for a holistic and individual concept of health, we have pointed at the complexity of the two concepts of food and health. From an ethical point of view, an integrative approach, which treats the cultural and scientific perspectives as complementary rather than mutually exclusive approaches, appears adequate. Two central ethical challenges may consequently be identified for personalized nutrition in relation to concepts of food and health, including cultural and value-laden aspects. First, with respect to food, personalized nutrition may benefit from an approach that not only considers the interaction between nutrition and health (risks), but also takes into account implications of the cultural meanings of food. Thus, beyond a focus on the biological effects of food intake, the significance of social and cultural dimensions of eating should be considered as affecting people’s well-being. Since the intake of food is determined not just by knowledge about the (individual) impact of different nutrients on health, but also by social conventions and cultural frameworks, research on personalized nutrition should explore in greater depth the interaction of the two perspectives on food. Individually tailored nutritional advice should not be restricted to information about recommended amounts of nutrients or nutrients that should be avoided. Personalized nutrition advice could for instance include suggestions for meals and recipes. Further investigation should address the following questions. How does increasing health information on food products and through personalized nutrition services influence food consumption of different groups of consumers? How does more widespread awareness of scientific knowledge about health effects of different nutrients affect cultural food traditions? Second, since the success of personalized nutrition depends on well-informed, motivated individuals, it seems accurate to approach food and health not just as scientific entities, but also as aspects of people’s social and cultural identity. Because of its aim of individualization and its focus on individual initiative and motivation, personalized nutrition might benefit from an approach that considers holistic notions of health with a focus on a person’s ability to pursue vital goals. If health is conceptualized as being related to the ability to pursue one’s vital goals, the kind of health to be promoted by personalized nutrition is dependent on individual preferences. The objective of personalized nutrition thus cannot be standardized. Dietary advice has to take into account not just individual health risks, but also individual differences regarding the level of ambition, willingness to change one’s diet, and lifestyle in relation to the kind of health that people strive for. People should therefore be expected to have different interests and different goals or levels of ambition with regard to promoting their health. Since health is related to vital goals, the objective of health promotion may also change with time. Thus, a holistic and individualized health concept implies an ethical challenge to personalized nutrition to take into account and respect individual differences regarding the objective of health promotion. This examination of the discourses about food and health and the discussion of their ethical significance for personalized nutrition have thus resulted in a view that advocates an integrated understanding of food and a holistic concept of health as the most supportive for personalized nutrition. This raises the question, how social and cultural concepts of food and holistic concepts of health are related to the aim of individualization in personalized nutrition. The individualizing aim of personalized nutrition is based on the increasing understanding of individual differences regarding health effects of food intake. As the scientific understanding of the interaction between food and health with regard to genetic variation and the influence of different nutrients on the expression of the genome grows, personalized nutritional advice seems to provide a significant complement to population based nutritional advice. The vision of personalized nutrition is thus to provide individuals with personalized dietary advice in order to optimize means of health promotion. Social and cultural concepts of food and holistic concepts of health seem to provide a basis for an important modification of the individualizing aim of personalized nutrition. In combination with each other, they highlight a view of the individual and the social or cultural as intertwined. An integrated concept of food emphasizes the individual as part of a social and cultural context. It also stresses scientific aspects of individual differences regarding food intake. A holistic concept of health emphasizes the need to differentiate individual ambitions and preferences from general, biostatistical definitions of health. Altogether, individualization appears in these concepts as an aim to be strived for within social and cultural concepts. The aim of personalized nutrition is thus supportive of a view of the individual as embedded in social and cultural contexts. As a consequence of its individualized approach, personalized nutrition should be seen not as a substitute but as complementary to more global preventive programs. This conclusion does not deny the extreme importance of pain and suffering. It is, for instance, impossible to make a phenomenological analysis of the typical case of illness without paying attention to suffering. For full-fledged and penetrating such analyses, see Toombs (1992). For an interesting attempt to amalgamate the notions of disability and suffering, see Van Hooft (1998).